To see their products to the Chinese market, medical device and IVD manufacturers will need to obtain National Medical Products Administration (NMPA) (formerly China Food and Drug Administration or CFDA) approval. 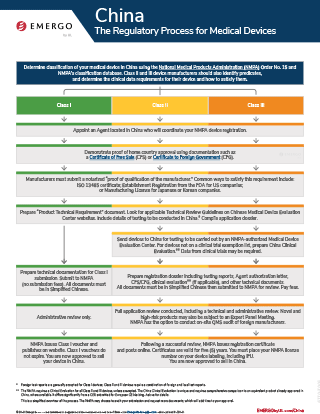 Find out more about the NMPA approval process in China by reading or downloading the chart below. The chart shown illustrates the NMPA approval process in China and is available for download in PDF format. However, if you would like to explain the steps to someone else in an email, you can cut and paste the text below or send them a link to this page. Determine classification of your medical device in China using the National Medical Products Administration (NMPA) Order No. 15 and NMPA's classification database. Class II and III device manufacturers should also identify predicates, and determine the clinical data requirements for their device and how to satisfy them. Appoint an Agent located in China who will coordinate your NMPA device registration. Demonstrate proof of home country approval using documentation such as a Certificate of Free Sale (CFS) or Certificate to Foreign Government (CFG). Manufacturers must submit a notarized "proof of qualification of the manufacturer." Common ways to satisfy this requirement include: ISO 13485 certificate; Establishment Registration from the FDA for US companies; or Manufacturing License for Japanese or Korean companies. Prepare "Product Technical Requirement" document. Look for applicable Technical Review Guidelines on Chinese Medical Device Evaluation Center websites. Include details of testing to be conducted in China. * Compile application dossier. For Class II and III devices: Send devices to China for testing to be carried out by a NMPA authorized Medical Device Evaluation Center. For devices not on a clinical trial exemption list, prepare China Clinical Evaluation. ** Data from clinical trials may be required. For Class I devices: Prepare technical documentation for Class I submission. Submit to NMPA (no submission fees). All documents must be in Simplified Chinese. For Class II and III devices: Prepare registration dossier including testing reports, Agent authorization letter, CFS/CFG, clinical evaluation** (if applicable), and other technical documents. All documents must be in Simplified Chinese then submitted to NMPA for review. Pay fees. Class I devices will undergo an Administrative review. Class II and III devices will have a full application review conducted, including a technical and administrative review. Novel and high-risk products may also be subject to an Expert Panel Meeting. NMPA has the option to conduct on-site QMS audit of foreign manufacturers. NMPA issues Class I voucher and publishes on website. Class I vouchers do not expire. You are now approved to sell your device in China. For Class II and III devices: Following a successful review, NMPA issues registration certificate and posts online. Certificates are valid for five (5) years. You must place your NMPA license number on your device labeling, including IFU. You are now approved to sell in China. * Foreign test reports are generally accepted for Class I devices; Class II and III devices require a combination of foreign and local test reports. ** The NMPA requires a Clinical Evaluation for all Class II and III devices, unless exempted. The China Clinical Evaluation is unique and requires comprehensive comparison to an equivalent product already approved in China, where available. It differs significantly from a CER submitted for European CE Marking. Ask us for details. This is a simplified overview of the process. The NMPA may choose to audit your submission and request more documents, which will add time to your approval.